The Bruins agreed to a 4 year deal with 24 year old star forward Brad Marchand. The deal is worth 18 million and begins after next season. 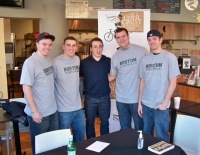 This will keep Marchand in the black and gold until after the 2016-17 season. Last season he scored 28 goals and added 27 assists in only his second season with the B’s. This will make Brad the 3rd highest paid forward on the roster, behind Krejci and Bergeron. If we did not extend his contract, he would have been a restricted free agent after this season (if there is one). 8 days till the old Collective Bargaining Agreement expires and we see our third sports lockout in under a year. This entry was posted in Bruins and tagged bruins, cba, hockey, lockout, Marchand, nhl by christoph131. Bookmark the permalink.